Each and every time I eat Indonesian food, one of my staple requests is gado gado. 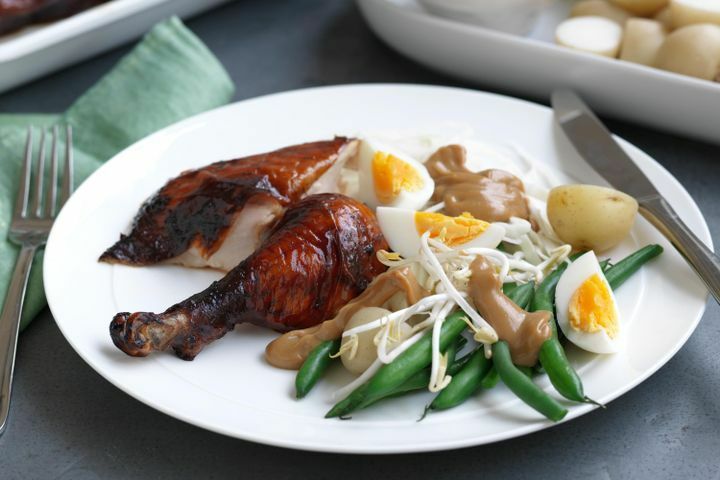 From the warm, filling up salad traditionally made out of boiled fruit and vegetables and topped with hard boiled eggs and a delightful peanut sauce. My mum is Indonesian and eating things such as this point out to me of her (which is bittersweet for me personally at this time as she actually is halfway around the world!) I'm pleased to her for producing me to the scrumptious, easy dish. For my version of gado gado, I've specified certain fruit and vegetables below, but genuinely you can toss this alongside one another using whatever fruit and vegetables laying around. Top it with some eggs and the peanut sauce and you're all set. I also recommend making a huge batch of the sauce when you do, and keeping it for other dishes. It will retain in the refrigerator for a couple of days and is also a delightful satay style sauce to provide with meats, fish and/or tempeh. Preheat range to 180. Combine 2 tablespoons of the kecap manis and garlic clove in a tiny bowl. Rinse out the hen and cavity with cool running normal water. Pat dried out with newspaper towel. Put in place a cooking dish. Multiply the kecap manis blend all around the chicken. Roast, cleaning sometimes with the dish juices, for 1 1/2 time or before juices run clear whenever a skewer is placed into the thigh.Cover with foil if overbrowning. Meanwhile, bring a sizable saucepan of normal water to the boil. Add the potatoes and make meals for three minutes. Add the eggs. Make meals for an additional 9 minutes, adding the coffee beans within the last 3 minutes. Drain. Peel off the eggs. Slice the potato pieces in two. Slice the eggs into quarters. Toss the cabbage, bean sprouts, potato and coffee beans on a huge platter. Season with sodium and pepper. Top with the egg. Place the coconut cream, peanut butter, curry natural powder and left over kecap manis in a tiny saucepan over medium temperature. Make meals, whisking often, for 3-4 minutes or until soft and the sauce involves the boil. Season with sodium and pepper. Cut the fowl into portions and put on an offering platter. Drizzle 1 / 2 of the satay sauce in the salad and provide the rest of the sauce privately.